Use this simple speaker project to become familiar with the basics of programming an Arduino. The main thing which makes this project super simple is that this project requires only one extra component. If you are new to Arduino, this tutorial will help you get familiar with Arduino and learn the basics of Arduino programming. This musical project has a speaker which plays out a song. 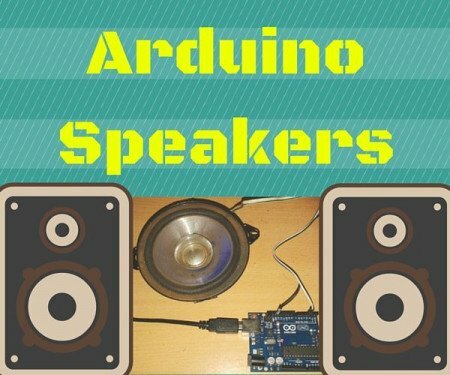 If you ever want to add some sound to your existing project, you can do it easily with this Arduino speaker tutorial. You can even make a musical car reverse horn and make it play songs. You can change it easily by uploading a new program. If you still remember how you made ringtones on those old Nokia cell phones, you pretty much have all the knowledge required to make any song with this project. Let’s get started. 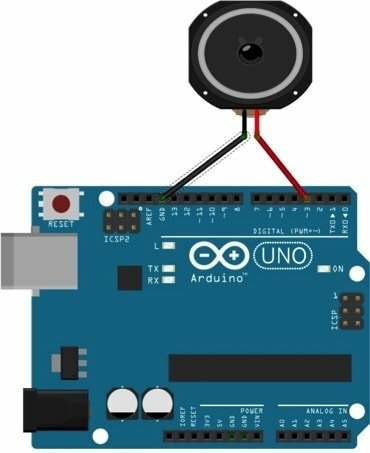 How Does the Arduino Speaker Work? The Arduino in this circuit creates tones of different frequencies and plays it through the speaker connected to it. The variation of the frequency of the tone (a.k.a. pitch) with correct timings (a.k.a. rhythm) creates music. The Arduino generates a signal and outputs it through the Digital pin 3. This drives the speaker connected to the pin to create sound. This can be used to play different songs by modifying this program. 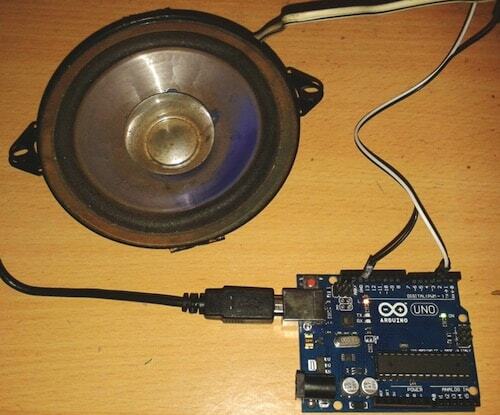 In this tutorial, I have programmed the Arduino speaker to play a song from the Malayalam movie ‘Ennu Ninte Moideen’. The program creates tones with a function, ‘tone( )’. It generates a square wave of the specified frequency (and 50% duty cycle) on a pin. A duration can be specified for this. Otherwise, the wave continues until a call to noTone(). The Arduino pin can be connected to a piezo buzzer or other speakers to play the tones. The code below uses an extra file, pitches.h. This file contains all the pitch values for typical notes. For example, NOTE_C4 is middle C. NOTE_FS4 is F sharp, and so forth. So instead of writing the frequency in the tone( ) function, we’ll just have to write the name of the note. This note table was originally written by Brett Hagman, on whose work the tone() command was based. 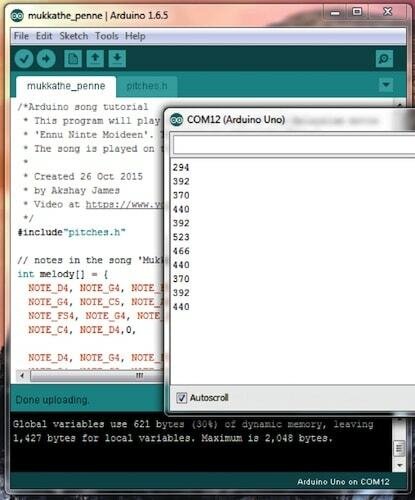 You may find it useful whenever you want to make musical notes for your Arduino speaker. If you take a look at the program, you can find two int arrays: melody[ ] and noteDurations[ ]. It is similar to how ringtones were written in old Nokia cell phones. The first array contains the notes and the second array contains its corresponding durations. I found out the notes of this song with my guitar. I wrote down the musical notes of this song first and then wrote the melody[ ] array with that. Then I wrote noteDurations[ ] according to the length of each music note. Here 8 = quarter note, 4 = 8th note, etc. Higher value gives longer duration notes. The note and its corresponding duration is what is there in melody[ ] and noteDurations[ ] respectively. You can modify those and create any song according to your wish! * 'Ennu Ninte Moideen'. The song is 'Mukkathe Penne'. * The song is played on the speaker connected to pin 3 and GND. // note durations: 8 = quarter note, 4 = 8th note, etc. Next, you have to create a new pitches.h file. 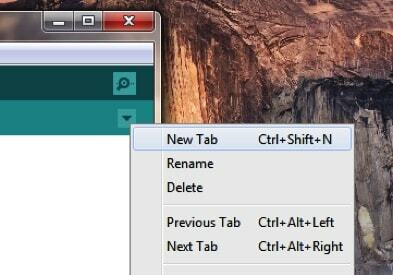 To make that, either click on the button just below the serial monitor icon and choose "New Tab", or use Ctrl+Shift+N. Then paste in the following code. And save it as pitches.h file. Now upload the main sketch to finish the Arduino speaker project by clicking the upload button. The song will then start playing. And if you open the serial monitor, you can see the frequencies of the output tone. You can check out the working demo of the Arduino speaker project in the video below.